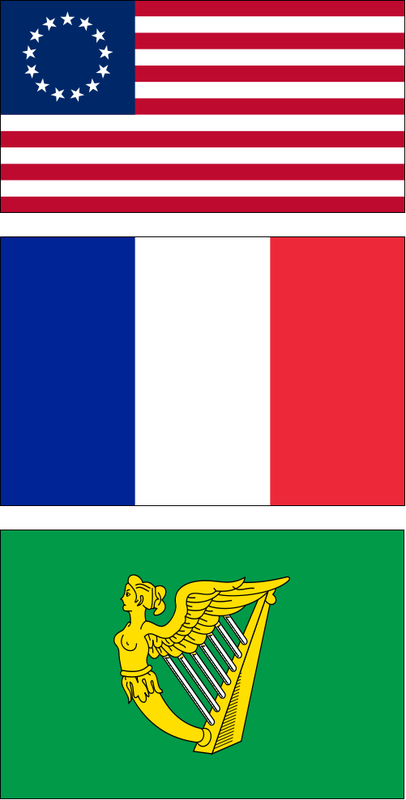 The flags of the three revolutions. So far in Second Year you've learned about important things that happened in Europe since the Middle Ages, things which changed the world. As you go further on through time, you get to some of the most important times in Europe (and elsewhere) in the last few hundred years: the Age of Revolutions. 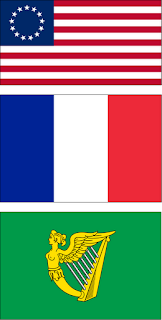 You'll study three revolutions: America, France, and the failed Irish rebellion of 1798. To keep things simple, I've given each of them their own page. They each share questions on exams (you'll be asked to answer a question on either America or France or Ireland) and the same People in History question applies to all three. Get the revolution you want by clicking on the link. America was colonised by Britain in the 17th century, but unfair rules led the colonists to revolt and form their own country: the United States of America. By 1798, the spirit of revolution had reached Ireland. But was it going to be successful? I am a student teacher who had been asked to cover Revolutions with 2nd year. However I am wondering how much content from each revolution the pupil's need to know? Do they just focus on one? I have 12 classes with them to cover this topic. Any help would be greatly appreciated! Thank you! A lot would depend on the structure of the class group. What are their levels like? Apologies I have only seen your reply now. They are mixed ability however they seem quite strong. The teacher said they are given a lot of notes and key terms to study to exam purposes however this would not really be great for my for supervision as I will need to be more creative. I have completed my scheme and have the lessons divided up into a set of 4 for each revolution. I have focused my lessons on Cause, Course, Consequence and key person. Apologies for my own late reply! That's a good way to divide them alright. If you're still looking for help send me an email at jasonkhistory (Gmail).